Piano Diploma with highest honours at the Conservatory with Willy Brezza, until two sudden events changed his life in 1999: he had to stop performing piano recitals because he suffered a car accident and he lost his young cousin Stefano while he was diving in the sea. One of Stefano's dreams was to establish a freedive record, thus Arrigoni promised to realize it for him and started training. He has kept this important promise since 2003, setting 20 world records in the sea, lake, under the ice and with his beloved dolphins. His sporting career was nearly interrupted by another heavy car crash suffered in 2004, but Arrigoni overcame this obstacle thanks to his strong willpower and to the mental techniques learned for freediving. By virtue of his experiences, Arrigoni thinks that in our life it's very important to make the most of our abilities, trying to turn difficulties in new possibilities. Freediving is really useful to improve our self-control, that's why Simone aims to divulge its potential to the wider audience with every sport performance, participating at conferences to illustrate the importance of these techniques and tutoring students, athletes and other professional categories including musicians, managers, lawyers, surgeons and disabled persons. He helds Safety at sea courses to students of primary and secondary schools, and collaborates with Giochi del Mare and Italian Coast Guard to divulge the slogan he invented: Never alone! This message wants to remind divers to never practice underwater activity on their own and to constantly watch over their companions. - Dolphin's Breath, which consist in freediving with monofin along a horizontal distance of predetermined length, periodically resurfacing to take a single breath of 1 second, and aiming at taking the lower number of single breaths as possible during the declared distance. The Dolphin's Breath was inaugurated by Arrigoni to disseminate two important slogans: Mind the dolphins, to raise public awareness to protect marine mammals and their environment, and Never alone, to remind divers to never practice freediving on their own for security reasons, following the example given by dolphins which live and swim in group and help each other in case of difficulty. 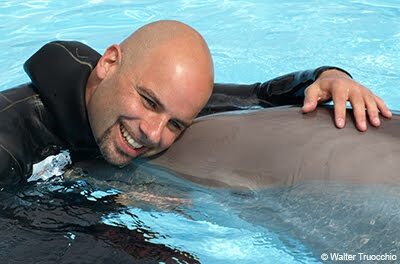 Arrigoni, who has been collaborating with Zoomarine Italia since 2008, participates in research projects led by Sapienza University of Rome on comparative physiology of man and dolphin. He is a successful photographer, with worldwide exhibitions, book and magazines publications, and more than 80 awards in the most prestigious international photo contests.